HA Architecture’s “fotän FABLE” anchors the southern boundary of “Creek Show,” integrating a piece of original fiction that is inscribed along its interior-lit profile. Photo by Leonid Furmansky. “Submerge” places blinking ripples above visitors’ heads. Photo by Leonid Furmansky. “Blind Spot” projects images captured from bicycle rides onto steel mirrors that balance on the creek bed. Photo by Leonid Furmansky. 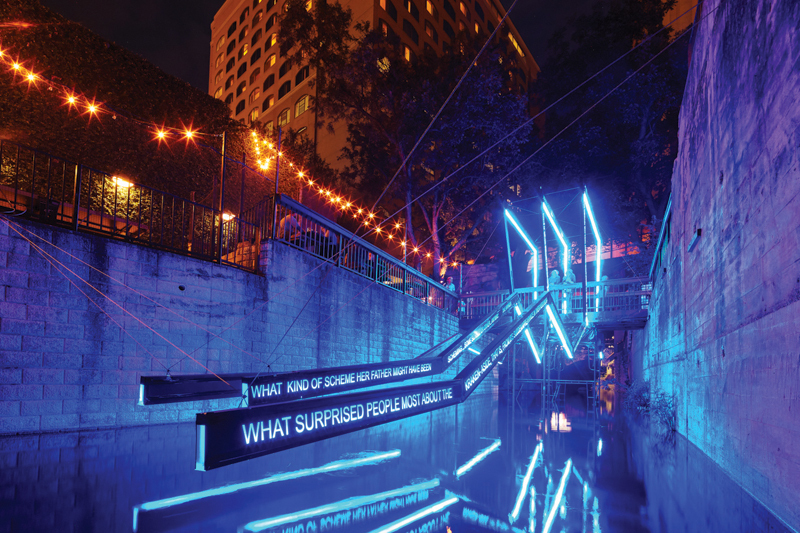 “Ephemeral Suspension” dangles an array of LED strands above the water, a reference to the creek’s microclimate. Photo by Leonid Furmansky. “Night Garden” by dwg. comprises 80,000 fluorescent survey flags, activated by blacklights, undulating with the topography. Photo by Leonid Furmansky. “No Lifeguard on Duty” furnishes an ironic swimming pool club for a waterway that will never have one. Photo by Leonid Furmansky. For nine nights in November, Austin was once again illuminated by the temporary light-based and site-specific art installations of “Creek Show.” Concluding its fourth year, and presented by the Waller Creek Conservancy, Creek Show seeks to bring attention to the future revitalization of Waller Creek, an urban waterway that runs longitudinally through Austin. The creek has begun a rapid transformation following the master plan of Michael Van Valkenburgh Associates, and will soon sport a series of bridges, pocket parks, and performance venues. The urban implications are far-reaching, as the creek meanders through both the campus of The University of Texas at Austin, as well as much of the downtown district, before emptying into Town Lake — arguably Austin’s true city center. Anchoring the southern boundary of the exhibition is HA Architecture’s “fotän FABLE.” Three strands of faceted, interior-lit segments — a built-up assembly of metal studs reinforced by 1/4-in steel gusset plates — hover supernaturally over the creek bed. The assembly dips low at its extents — almost touching the surface of the water — but lurches up and over a small pedestrian bridge near its midpoint. Vertical faces of the installation are lit with excerpted prose from a work of original fiction by award-winning author Manuel Gonzales, and visitors are encouraged to both observe and read the installation as they move through and around it. As guests move north along the creek, they encounter “Submerge,” by Davey McEathron Architecture, Drophouse Design and Fabrication, and Studio Lumina. Concentric LED circles, representing ripples on a water surface well above guests’ heads, blink slowly, giving the impression that visitors are themselves a part of the creek. In this way, its creators suggest that Submerge encourages self-reflection and mutual concern for the shared, inhabitable space of the waterway. A few steps away is “Blind Spot,” by TwoPlus Collaborative. Sited adjacent to a pedestrian-friendly stone water crossing just north of 6th Street, Blind Spot employs a series of steel mirrors strategically located within the creek bed. Video projections that capture the experience of bicycling throughout town are superimposed on the mirrors, indicating that, like cyclists on the city’s streets, Waller Creek itself has been caught in Austin’s collective “blind spot” — until now. 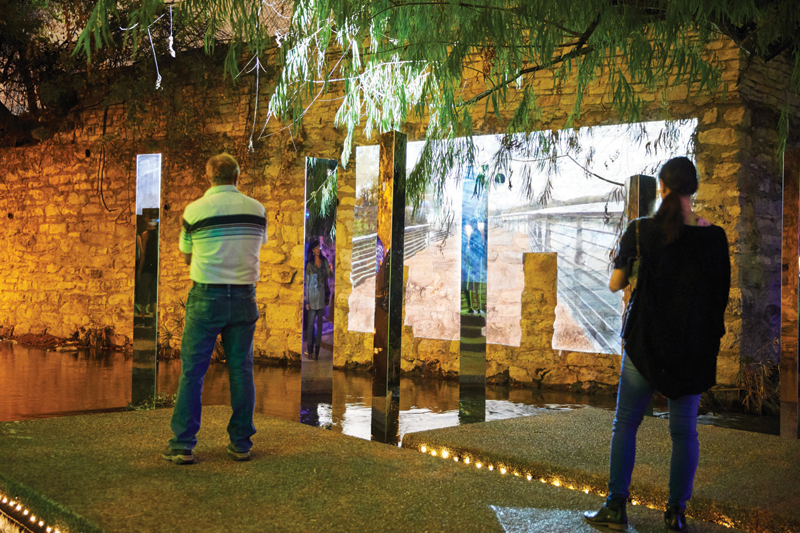 The installation’s creators hope the immersive, shared experience initiates a dialogue about the importance of investing in the urban, people-oriented spaces of Austin. “Ephemeral Suspension” appears next, dangling from the barrel-vaulted stonework below the 7th Street bridge. Designed by PATHOS + Touch To, varying lengths of flexible LED strands attach to a regular grid which follows the contour of the vault above. 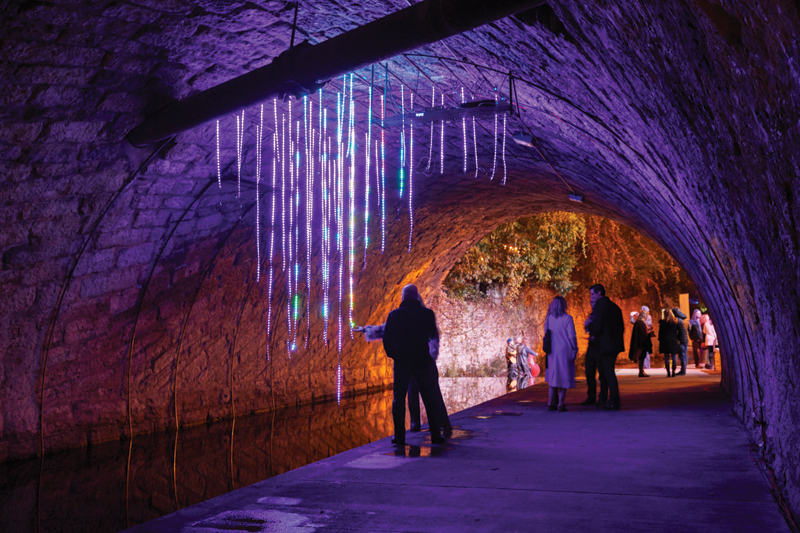 At once hovering over the heads of visitors while also descending to nearly touch the creek surface, the lights flicker in a programmed sequence to dazzling effect. 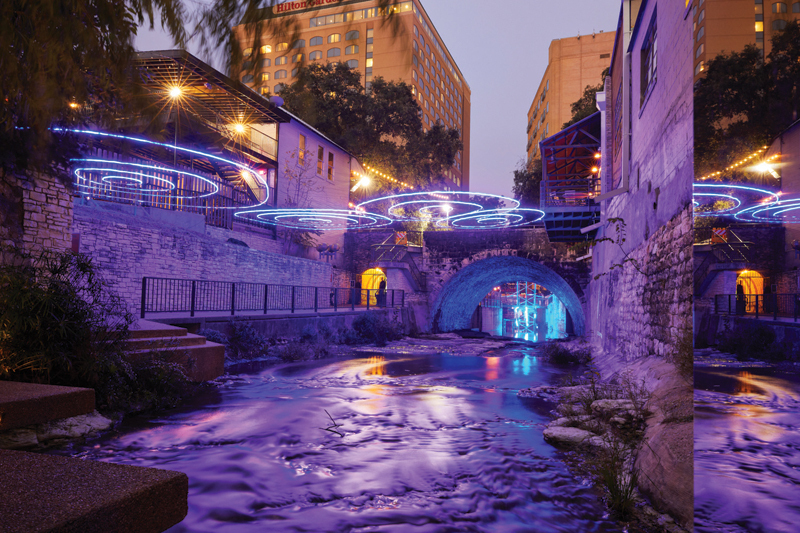 A reference to the natural processes of evaporation, rainfall, and flow typical of the creek’s microclimate, Ephemeral Suspension takes its inspiration from intangible processes caught in midair. Striking by virtue of its sheer scale is “Night Garden” by dwg. Intended to be a space for dreaming, dwg. 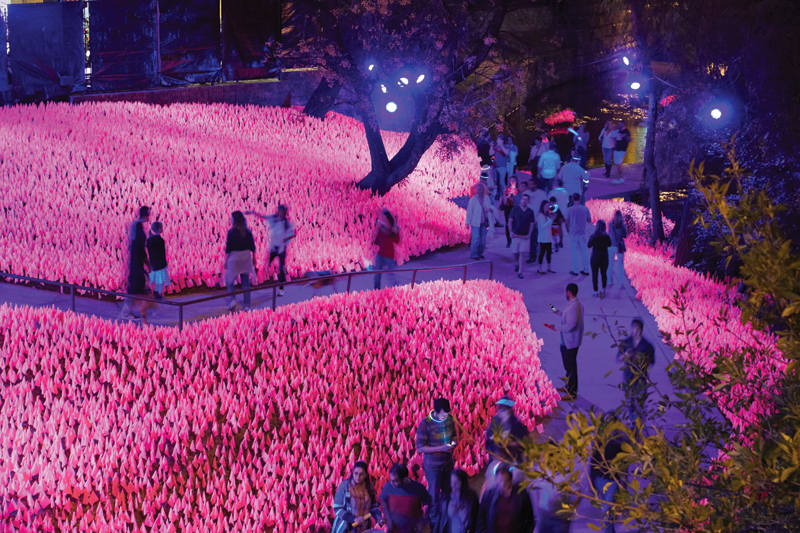 responded to Austin’s collective dream of a realized Waller Creek transformation by densely “planting” 80,000 fluorescent survey flags at the creek’s edge. Illuminated by black light, the flag-carpeted topography vibrates with shades of brilliant pink against the dark night. Subtle changes in wind direction create the impression of a teeming, neon forest floor. Reinforcing a belief in waste minimization, dwg. plans to donate all 80,000 flags to Treefolks, and aims to coordinate with the organization to see that each flag results in a new tree planted along Austin’s waterways. Bookending the northern extent of Creek Show is “No Lifeguard on Duty,” by Asakura Robinson. 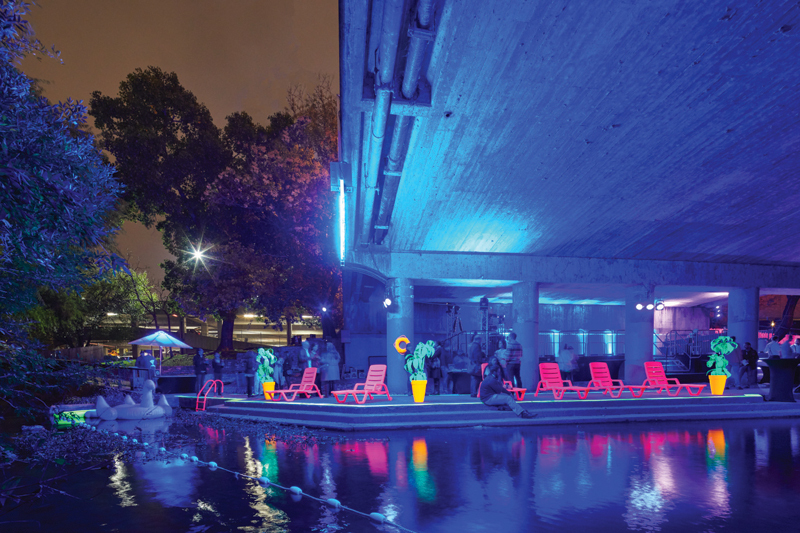 The site, beneath the 8th Street bridge and adjacent to shallow steps and an aging weir, is reimagined as a fluorescent swimming pool club for a waterway that will never have one. Neon script signaling the name of the installation is mounted above the scene, a reference to the city’s culture of neon-based art. Complete with inflatable toys, lounge furniture, and even a pool stepladder, the cheeky installation becomes a de facto gathering point (premium selfie-spot), whether guests are beginning or ending their tour of Creek Show. Christopher Ferguson, Assoc. AIA, is a designer at Clickspring Design and cofounder of DO.GROUP DESIGN.